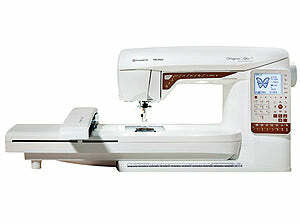 Designer Topaz 25 has top & bottom thread break sensor, Internet updates, large sewing surface, sewing advisor. Husqvarna Viking Designer Topaz 25 Sewing And Embroidery Machine. Official Video Shows Topaz 20 And Topaz 30. Imagine. Create. Shine. It’s magical the way sewing plus embroidery turns something ordinary into something extraordinary. With the DESIGNER TOPAZ™ 25 sewing and embroidery machine you also get the advantage of built-in assistance and time-savers to help you bring your ideas to life. Push your creativity to a completely new level. Expect fabulous sewing and remarkable embroidery! Husqvarna Viking Designer Topaz 25 Features. Top and Bobbin Thread Sensor notifies you when the top thread breaks or bobbin thread is running low. Internet updates ensure that your DESIGNER TOPAZ™ 25 sewing and embroidery machine is always up-to-date. Large embroideries are fast and easy to sew thanks to the high embroidery speed. The Automatic Thread Cutter instantly cuts your top and bobbin thread when touched – time-saving and convenient. The Exclusive SEWING ADVISOR® feature optimizes your sewing by selecting the best settings and giving you on-screen advice. Husqvarna Viking Designer Topaz 25 Stitches. 160 stitches including; 7 mm stitches, Utility stitches, Quilt stitches, Decorative stitches and 3 Programmable Alphabets. 75 Embroidery Designs and 1 Embroidery Font in three different sizes included. Husqvarna Viking Designer Topaz 25 Accessories In Box. Large Embroidery Hoop (240 x 150). Stylus, Thread net (2), Felt pad (2), Screwdriver, Seam ripper, Brush, Spool cap, large (attached on the machine upon delivery), Spool cap, medium (attached on the machine upon delivery), Spool cap, small, Multipurpose tool/Button reed, 6 Bobbins (1 in machine at delivery), USB embroidery stick (1 GB), Software to download, Carrying Case (attached on the machine upon delivery), Foot control, Power cord, Needles, Embroidery thread, Pieces of fabric and stabilizer, DESIGNER TOPAZ™ 25 Sampler book, Warranty card. Consumers Digest Best Buy Rating. The HUSQVARNA VIKING® brand received the distinguished Consumers Digest Best Buy rating on 4 machines including the HUSQVARNA VIKING® DESIGNER TOPAZ™ 40 & DESIGNER TOPAZ™ 25 sewing and embroidery machines and HUSQVARNA VIKING® OPAL™ 670 and OPAL™ 650 sewing machines. According to the publication, products receiving the Best Buy designation merit special attention from consumers based on their combination of eight criteria: performance, ease of use, features, quality of construction, warranty, efficiency, styling, and maintenance and service requirements. Husqvarna Viking Designer Topaz 25 Information. Designer Topaz 25 Features And Benefits. Designer Topaz 25 Web Page.